Our hard surface tent flooring is based around the Pro-Stage product. With our vast inventory of leg supports & trussing system, we can conquer any terrain in any location giving you that perfect event floor. Our stage decks work amazingly well for a sub floor for a marquee rental. The flooring is finished with charcoal black carpet or a black painted timber. 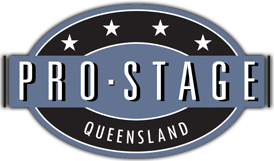 At Pro-Stage Queensland we work as part of your team, delivering personal service, great value and total reliability.